Thompson Square Announces "Brunch & Bowl" Fan Party! 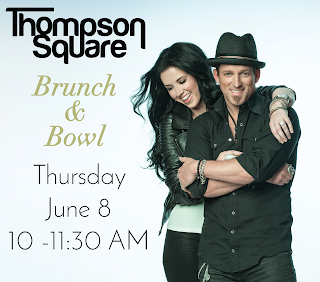 Thompson Square will be hosting a "Brunch & Bowl" Fan Party at Pinewood Social on Thursday, June 8, 2017 from 10 AM to 11:30 AM! Tickets will be available on May 19th at 10 AM CT and will cost $50. Tickets: $50 / On Sale May 19th at 10 AM CT Here!